2. Browse our Menu and make your choice. 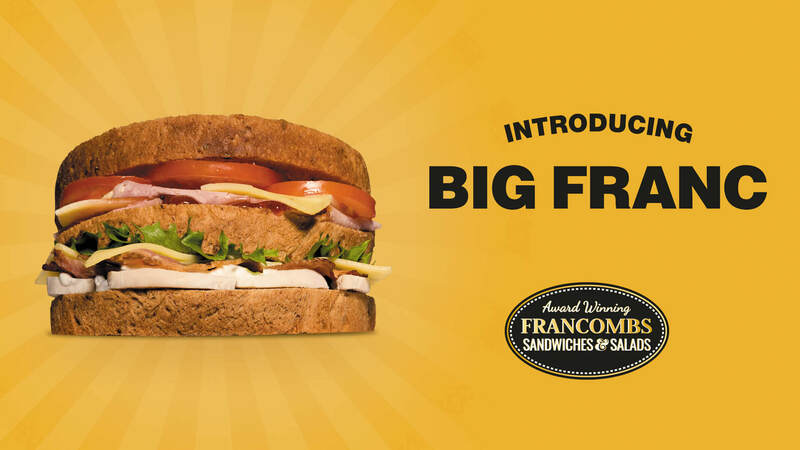 At Francombs, our lunches are made fresh in our kitchen daily. So when it comes to making that crucial decision of what to go for, we know what matters most; choice, quality ingredients and affordable prices. We strive to deliver all of those, without compromise, to keep our customers satisfied and make sure they come back for more! All of our food is handmade with care and to order, using a wide selection of fresh ingredients. You can select from our Classics or Signature Specials or pick & mix your own combination, meaning that lunch never has to be the same again. But we’re more than a one-trick-pony as we offer hot, steaming teas and coffees, and fantastic buffet and event selections. 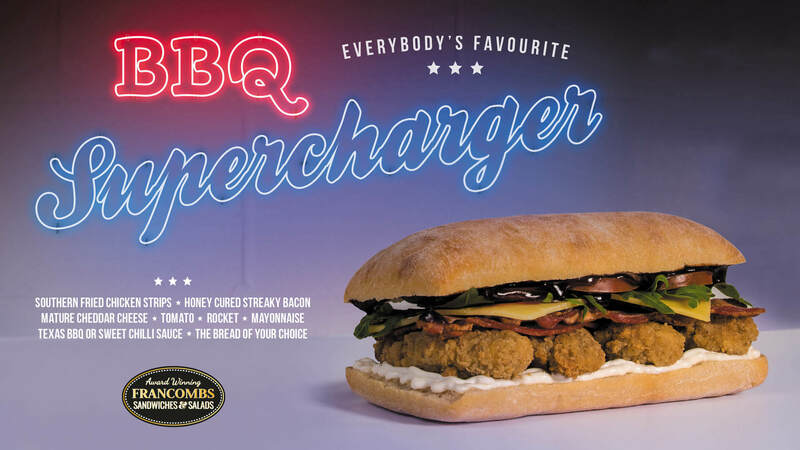 So why not pay us a visit and enjoy a little something that your heart (and belly) desires, eat in or takeaway. No time to visit? Simply order online and we’ll deliver your lunch straight to you, in the Medway, Dartford and Kingshill areas. You can order online for collection too, so no waiting around during your lunch break. 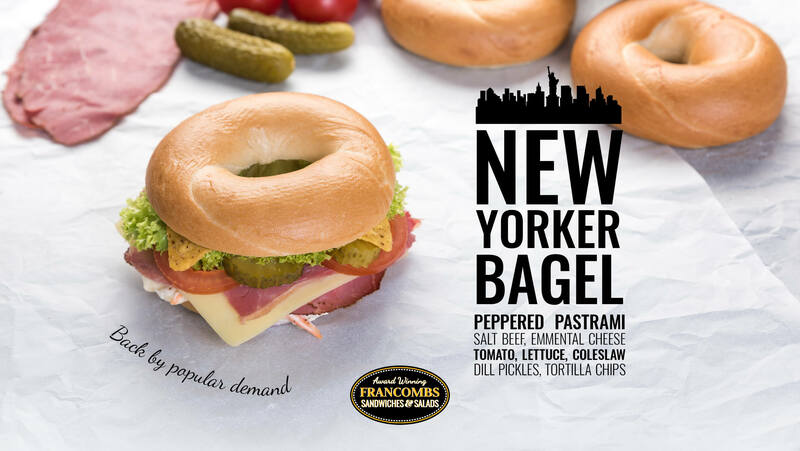 Delicious sandwiches, made to order and never pre-packed. Our bread is fresh everyday and we have countless ingredients and sandwich fillings for you to create your perfect sarnie. Can’t choose? Trust in us and pick one of our carefully crafted Signature Specials. Choose from one of our Signature Salads which cater for every taste, or go wild and create your own special blend which can be as healthy, or as naughty as you like! Either way, your salad will be handmade, from fresh ingredients, exactly to your liking, as soon as you order. Fancy a little bit on the side? We have a wonderful selection of sweet (and savoury) treats, to top off your lunch or fill that hole in the afternoon! Go on, you deserve it! And if you just can’t start the day without a freshly made tea or coffee, then make sure you stop in and grab your daily brew. Start your day the Francombs way, with a hot, toasted breakfast muffin! There are 14 delicious combinations of ‘Franc Muffin’, so whatever your hunger level, we’ll get you through until lunchtime! Create your dream burger in 6 simple steps! 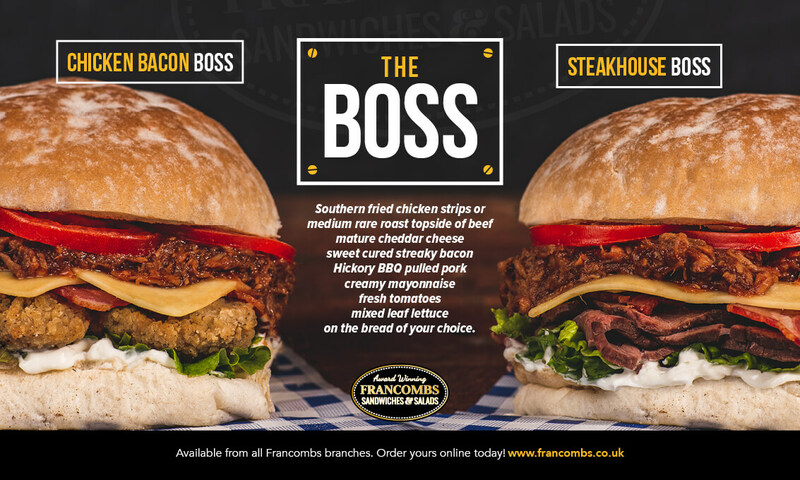 Choose from 4 or 6 oz flame grilled beef burgers, 100% chicken breast goujons or vegetarian super burgers. Add from a choice of toppings, including pulled pork, bacon and onions, make it cheesy (we have nine varieties!) freshen it up with salad and select your sauce, et voila… you’re just moments away from tantalizing your tastebuds! 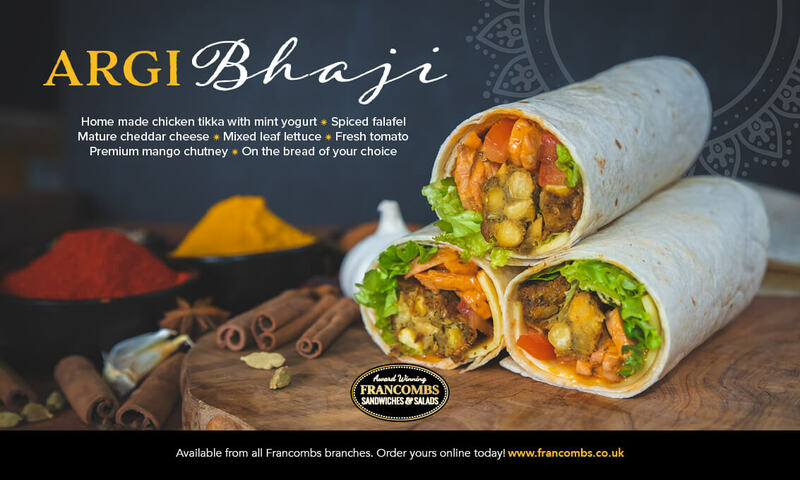 In order to make sure our food gets to you as hot and fresh as you expect, our grill is only available for in store collection or local delivery to Francombs HQ on the Medway City Estate. Got an event coming up or need to impress at that all-important client meeting? No problem, we’ve got it covered with our extensive selection of sandwich and savoury platters. Keep it simple or mix it up, no matter how many mouths you need to feed. 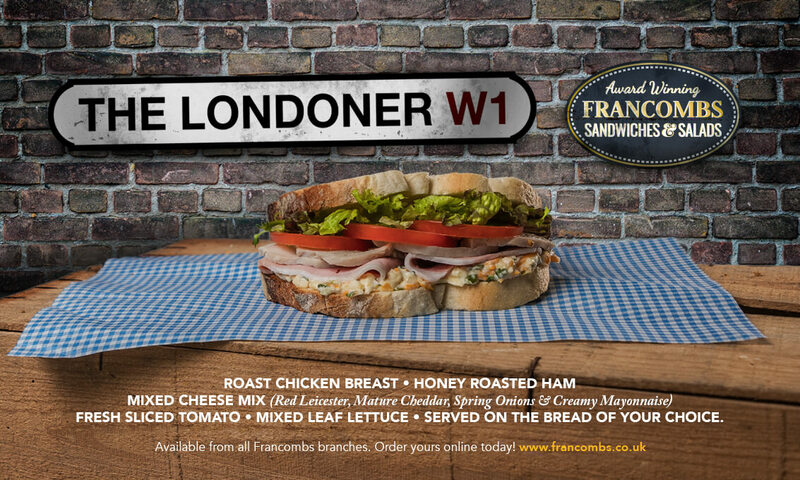 Our team delivers all our freshly made, award winning sandwiches and salads to the surrounding areas of Medway, Gillingham, Kingshill, Larkfield and Dartford Crossways. If you are based in an office close to these areas and would like to know if we can deliver to you, then please get in touch as our delivery areas are expanding all the time. Delivering sandwiches and salads between 08:00 – 2:30 to offices located on Medway City Estate and surrounding areas. If you are based in a office close to these areas and would like to see if we cover your area please get in touch as our delivery area is expanding all the time. Delivering sandwiches and salads between 11:00 – 2:00 to offices located on Kingshill, New Hythe business parks and surrounding areas. If you are based in a office close to these areas and would like to see if we cover your area please get in touch as our delivery area is expanding all the time. Delivering sandwiches and salads between 11:00 – 2:00 to offices located on Gillingham Business Park and surrounding areas. If you are based in a office close to these areas and would like to see if we cover your area please get in touch as our delivery area is expanding all the time. Delivering sandwiches and salads between 11:00 – 2:00 to offices located on Dartford Crossways Business Park and surrounding areas. If you are based in a office close to these areas and would like to see if we cover your area please get in touch as our delivery area is expanding all the time. Collection is available from our store on the Medway City Estate in Rochester. Last orders for collection is 2.30pm Monday to Friday. Our products are made in an environment where GLUTEN, NUTS, SESAME and OTHER ALLERGENIC INGREDIENTS are used. We therefore cannot guarantee that products produced in our stores will not contain traces of these allergens. For information on our products please speak to a member of team to discuss your allergy further. We have tough codes of practice. Our suppliers are regularly and independently audited against rigorous and recognised standards. Our team is trained in food safety management, safe handling of food and good hygiene in line with the Food Standards Agency (FSA) Hygiene Rating System. In FSA tests, we are proud to announce we hold a 5* food hygiene and award. It is vitally important to us that our store meets our high standards of excellence. Our inspectors can turn up unannounced at any time. If this was on my doorstep I would be as big as a house. Great food so very fresh with a choice of breads. Good Selection, fair prices and Excellent Service. Fantastic sandwich and the best pies I've ever tasted! All finished off with a slice of carrot cake that was amazing. Perfect.